The range of Franke kitchen taps includes a wide range of designs that are suitable for any kitchen, whether Modern, Traditional or Contemporary. The tap is one of the most important items in your kitchen and not only gets used the most, thanks to the never ending tasks such as food preparation and washing up, but can also become the main focal point. Franke taps are built on a tradition of quality, providing a product that will be delivering exceptional reliability for many years to come. 3 years on moving parts and 1 year guarantee on coating and finish from Franke against any manufacturing faults. 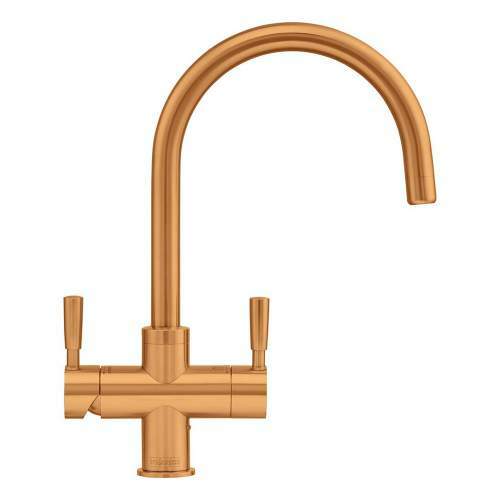 The Franke Omni 4 in 1 kitchen tap not only delivers your standard hot and cold water for such duties as washing up etc but it also has the facility to provide almost instant 100° boiling water and pure, fresh drinking water. The Omni tap is simple to fit into either your new kitchen design or replace your existing kitchen tap. We supply the Franke Omni range of products as a complete kit. Therefore when you purchase this item from us, it will include the tap, the hot water tank and the filter system. No need for anything else other than a competent plumber/installer! Ongoing maintenance is simple and straight forward. All you have to remember is to replace the filter every 6-9 months on average (subject to useage). Its a straight forward process and does not need a plumber to complete. Just ensure the filter is installed in an easily accessable position. The Omni tap has safety built in too. In some ways its actually much safer than using a kettle. The Push lever on the boiling water is a simple and easy way to protect from the boiling way being dispensed accidentally, excellent for those little curious hands. The construction of the tap also means that the temperature of the boiling water is kept away from the external service. The tank on the Omni model has a capacity of 4.2 litres. That is enough to delivery instantly around 8 mugs of tea or coffee or two pans of water. The Omni system simply uses a standard 13am 3-pin plug and uses very little power to keep the water at 100°. In fact the system only uses an average of 0.8 watts of electricity per hour in standby mode. That equates to roughly 1p per cup! The Omni 4 in 1 is not suitable for low pressure systems and therefore requires a minimum of 1.5 bar pressure on both hold and cold water supplies. If in doubt, please contact your plumber/installer before purchase or call 01759 307262 and discuss your system with one of our experienced technical advisors. In the unlikely event that your Franke kitchen tap develops a fault during your ownership, you can be confident that a global company like Franke has a robust aftersales service in place. Franke taps are guaranteed for a period up to 5 years. Valve mechanisms and working parts are covered for 5 Years. Coatings, finishes and 'O' Rings are covered for 1 Year. Franke will provide replacement parts if your tap develops a manufacturing fault. Other products within the Franke tap range may have a variation on the standard warranty period. For example, the Franke Minerva 3 in 1 hot tap is guaranteed for 2 years from the date of purchase and the Franke Omni 4 in 1 for 3 years. When choosing a Franke kitchen tap it is important to understand the requirement for the tap to work in conjunction with your hot water system. Some Franke taps require a high pressure system and therefore will not provide an adequate flow of water. Our technical team have over 20 years' experience in dealing with Franke products and are available to offer help and assistance to you. If you require Franke technical help, please call 01759 307262 or use our LIVE CHAT facility. In addition to your Franke tap, if you require a suitable Franke kitchen sink or any other kitchen sink from our extensive range of products then please browse the many thousands of options by using the main menu. We have a considerable selection of high quality sinks from Stainless Steel, Undermount, Granite, Ceramic and Belfast. You may also be interested in fitting one of the ever-popular Franke Waste Disposal units to your new sink.